A lovely place for lunch I will be happy to go back to again, Shang Palace is an award-winning Hong Kong restaurant that offers a very good dim sum. The wine list is good and varied but, could use more focus. 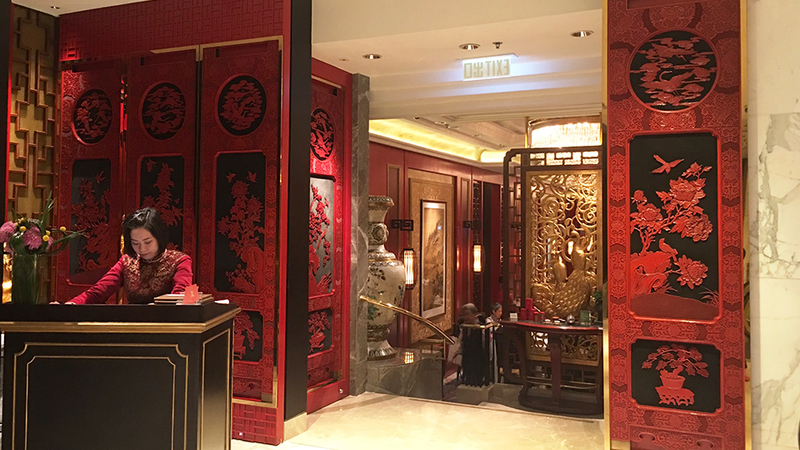 The minute you step into Shang Palace’s ornate but eye-pleasing dining room located in the lower level of the Kowloon Shangri-La hotel, you feel like you have entered a world that could not be more “imperial Chinese restaurant”. Lacquered, high soaring ceilings, red and gold everywhere (apparently reminiscent of the Song dynasty), carved wooden screens and Chinese window frames, large Chinese pictograms, Sung-style paintings, but also very good food, wines and a friendly, attentive staff make enjoying the dining experience very easy indeed. Despite the hotel location, there have been few tourists or Caucasians in sight most times I have been here. The tranquil atmosphere adds to the feeling of having stepped back in time. 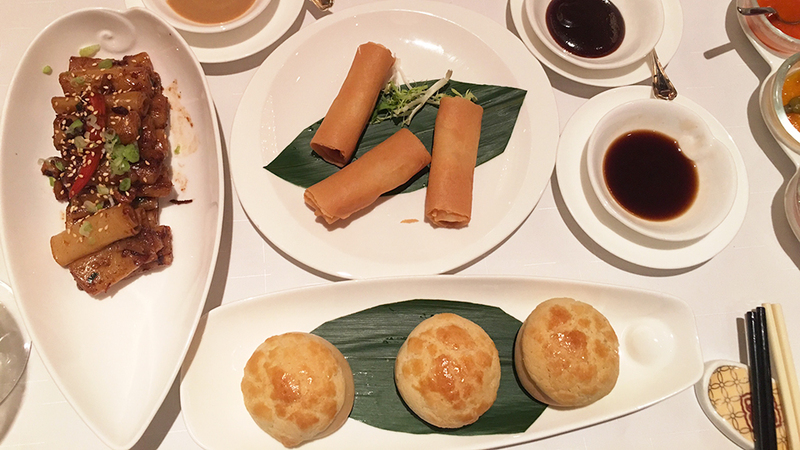 Shang Palace is a multiple award-winning restaurant that specializes in Cantonese cuisine, with dishes that exude noteworthy refinement and delicacy. Chef Cheung Long Yin, was appointed the restaurant’s Executive Chinese Chef in October 2017, taking over from another star chef, Mok Kit Keung, who moved to the Shangri-La Singapore Shang Palace restaurant. Yin has accumulated over thirty-two years of cooking experience focusing on Cantonese cuisine. He was previously Master Chef of The Hong Kong Jockey Club Racecourses’ Chinese restaurants, and before that, worked for fourteen years at The Peninsula Hong Kong. Over the years, Yin has won a slew of awards for his work, including the Distinction Gold Award for Appetizers at the 10th Asian Culinary Exchange 2016, a Gold with Distinction Award at Gourmet Master Chef 2014, and a Gold award for Creative Appetizer at the Modern Chinese Cuisine Challenge of Hong Kong International Culinary Classic HOFEX 2013. His dishes tend to be creative but are always inspired by local Hong Kong ingredients and flavors. 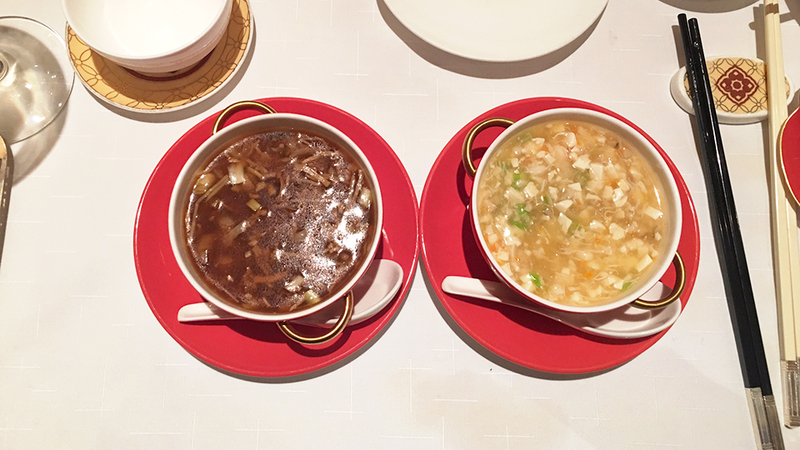 The two soups I tried on my latest visit (braised bean curd soup with seafood, bamboo fungus and crab coral sauce and a minced fish with black fungus and vegetables in thick soup) were both stellar, precisely rendered, flavorful yet refined. I finished both much faster than I had anticipated. The dim sum dishes were even better, with the crispy spring rolls with shrimp and yellow chives effectively very crispy and not at all oily. I especially liked the stir-fried rice flour rolls with dried shrimp and X.O. chili sauce that offered the appropriate springy, spongy texture and a very intense, precise presence of the chili sauce. The baked barbecue pork buns were fluffy and stuffed with pork of superior quality that literally melted in my mouth, while the deep-fried shrimp dumplings with mango salad provided a refreshing touch that made me want to start eating all over again. The wine list boasts about 1,200 selections, though not all are as centered as a similar dining spot might warrant. One commendable aspect is that there are numerous wines listed not commonly found in other high-end Hong Kong restaurants, which adds considerably to the pleasure of the dining experience. The 2013 Pearl Morrissette Chardonnay Cuvée Dix-Neuvième Twenty Mile Bench is such a wine, made from a cultish Ontario producer that is all the rage with the minimal-interventionist crowd. Frankly, over the years I have found some of Pearl Morrissette’s wines to be flawed, with off-odors, but when they are right they are absolutely beautiful examples of what Ontario can do so well, and by that, I mean truly world-class wines. A case in point is this Chardonnay: close your eyes, and you’d think you were drinking a high-quality wine from Puligny-Montrachet, but with more acidity. Long, mineral and refined, this is a noteworthy Chardonnay. 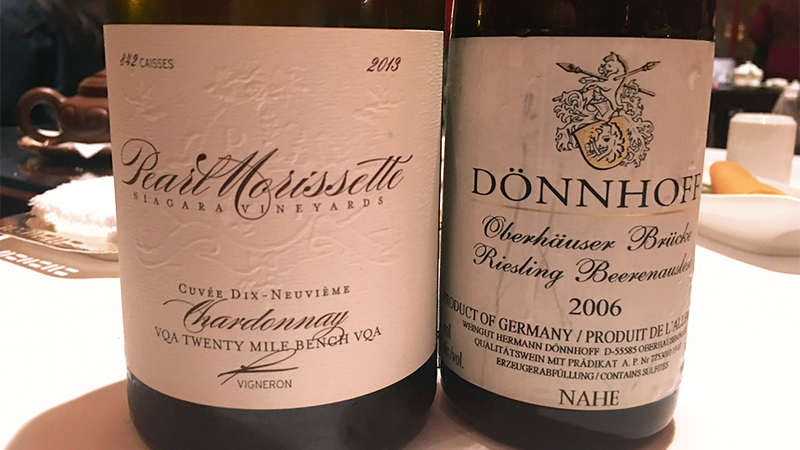 The 2006 Dönnhoff Oberhäuser Brücke Riesling Beerenauslese, from one of my favorite wine estates and vineyards, is a gem, but a little less rich and sweet than you might expect a Beerenauslese to taste. A touch of botrytis adds welcome complexity to honeyed tropical fruit and lemony flavors to this light, lively and refined Riesling that lingers well into my return trip home.